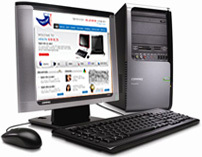 All desktop PC’s from Arron Services are created upon your own specification and built by our engineers. We are able to provide you with the latest technology to satisfy children with games or provide computers for the work place. We are also able to supply a varying degree of peripherals, including monitors, speakers, microphones, webcams, printers and backup devices. All Desktop PC’s come with 12 Months Norton Internet Security Software supplied & installed. All desktops include; creation & setup upon customer specification, delivery at home or at the office, setting up on your internet connection, transferring e-mail, transfer of all data & installation of printers if so required. Desktop PCs from Arron Services are created to the customer's specification and built by our own engineers. 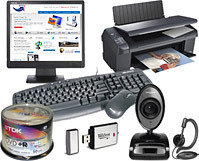 We can also supply peripheral products such as monitors, speakers, microphones, webcams, printers and backup devices. Also, all Arron Services' desktop PCs come with 12 months Norton Internet Security Software.